This Dads Rock Giveaway is perfect for the frugal dad who wants to pack his lunch! EasyLunchBoxes.com was created by a mom to make it simple to organize and quickly pack healthy lunches without wasting money, time, paper or plastic! These BPA-free, eco-friendly 3-compartment food containers and colorful cooler bags make packing on-the-go meals fast, affordable and green. I was very excited about these because I have looked everywhere for the compartment food containers with no luck. These are a very nice quality, sturdy and a good size. EasyLunchBoxes.com is giving a set of 4 containers and a lunchbag to one lucky winner who gets to pick the color they want. My daughter’s favorite color is purple, so that’s the one I got. She was so excited about it! Enter now to win one for your family. EasyLunchBoxes.com is offering a lunch box system including a set of 4 containers and a lunchbag to one randomly selected winner. I will announce the winners on June 15th. Faithful Provisions Giveaway Disclosure: EasyLunchBoxes.com sponsored this giveaway by providing me with a lunch box system and one to give away to randomly selected winner. For more information about Faithful Provisions, please read my Disclosure Policy. 5. Follow Faithful Provisions and/or EasyLunchBoxes.com on Facebook – just paste this message on your personal Facebook wall so your friends will see it. Giveaway ends June 15th at midight CST. The winner will be drawn using Random.org. Winner will be notified via email and I will post the winners at Faithful Provisions under Giveaway Winners. Great giveaway! Something we really need! THanks! We need this – we always pack his lunch! This might remind the people in our house to bring back the containers that we packed the lunch in 🙂 Thanks for the chance to win. .-= Jennie´s last blog ..The Choice is Clear… =-. Just found the site beacause of Dad’s Rock . I am now following on facebook. Thanks! We always pack our lunches. This would be very nice. This looks fantastic – my husband would love this! We are always running out of lunchboxes, so this would definitely get good use at our house! Cool concept instead of a bunch of different containers/bags. This would be perfect for our picnic lunches at the aquarium! I would love this. Great giveaway! This is something I have been looking for, and would definitely use! This would be awesome. We are trying to get back on a diet and help dad pack healthy lunches and this would be an awesome way to do it. What a great idea for Father’s Day! And great for the environment as well. This would be great as I pack my lunch for work every day! What a great idea! My husband and I were just wondering if there were any products like this out there. I would love to win this for my hubby as that’s one way we try to save money – him taking lunch to work everyday. This would be perfect! Awesome! I’m going to check out the site now. This would be great! My husband refuses to take his lunch to work because it ends up all mixed together and soggy. Oh so looks like a great thing for my girls lunches. This would be great for me or my hubby….we both try to take our lunch to work instead of eating out! This would rock for my hubby! He faithfully takes his lunch to work every day doing his part to help us save so I can stay home w/ the little ones! Thanks for the chance to win! I’m a fan on Facebook too! This would be wonderful to win for him at work : ) Thanks for all those great Dad giveaways! I have a cheap one of these that is falling apart. We definitely need a replacement since we pack lunches every day. Love these!! Would love this – thanks! What a great give away! My hubby packs his lunch every day and this would work so well for him! I love this lunch box! Always looking for things like this! Perfect. I have been looking for something like this for my lunch. .-= Susan´s last blog ..24 weeks … and counting =-. this would be so handy! My husband and I pack his lunch every day for work! Saves money for other important things! I love your great giveaways! Would like to win this one for my brother in law! Looks great – sign me up! My son is starting Kindergarten and this would be so easy for his lunches. 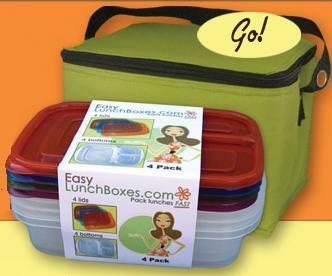 FB fan of yours & Easy Lunchboxes.com. Posted it as well. Follow on fb. This would be alot better then plastic bag and he might remember to grab it in the morning. My husband almost always packs his lunch. This would be great! My husband has been wanting a new lunch box, this would be great! LOVE this idea for hubby & 2nd grader!! My husband always takes his lunch. We would love to have these! This would come in VERY handy around here. Maybe DH would stop taking his lunch in a grocery sack! This was really come in handy at our house! .-= Lisa @ Simplified Saving´s last blog ..Crazy Pinz: 3 games of bowling for 1 person plus rental shoes only $8 =-. Great lunch idea! Love it!! Hi! I follow you on FB! .-= Crystal´s last blog ..Free Aussie Tizer Outback! =-. I subscribe via email 🙂 Thanks for the giveaway! My husband works two jobs, so a lot of his meals are outside the house. This would be great for him to have!! Thanks! my husaband always takes a lunch so this would come in handy. With 2 kids about to go to school, would love to try this! You go girl! This is so fun! Would love to win this for my husband! Although I would have to keep myself from stealing it! My husband takes his lunch daily! Thank you for the chance to win!! I’m following on FB 🙂 This is a great idea! Great giveaway! I pack my husband’s lunch every single morning, so this would be perfect! What a great giveaway! My husband takes his lunch every day and this would be perfect for him. This is a great giveaway! It is hard to find dishes that are lunchbox packable! Great giveaway! My husband would love these since now I am making him take his lunch to school every day! This is really cool. I would love to win one to pack my husbands lunches in. I just found your website because of Dad’s Rock, this would be great for my husband! this would be a great gift for a dad who is trying to be healthy and save money all at the same time!! hope to win it!!! these look awesome! love your blog! thanks for the chance to win such a great giveaway! This is fascinating! I could use this for my whole family of lunch packers!!! Think this would be great to have for packing the kids’ lunches when we are out and about! This is an AWESOME giveaway. Would make taking lunches to work for hubby so much easier! I take my lunch to work everyday. This would be an awesome prize for me to win!!! My husband really needs these for his lunch and it would make my job so much easier! This is really cool. I make lunches for my DH every day and I would love to use this! What a great give away! We would love this! This looks like an awesome way to take your lunch. Thanks for offering it. I hope I win! These containers would be very handy around our house. Would love to win also!!! Added your giveaway to my FB Wall. Would LOVE to win this for my husband because he packs his lunch for work. I would love to have this! Perfect for those park days with the kids, i have 3. Thanks so much!!! awesome giveaway! My husband takes his lunch in a plastic shopping bag right now! this would be a great help with packing daddy’s lunch for work!! I have been searching for a container like this to make homemade “lunchables” for my daughter. What a great gift for Dads! Thanks so much for offering it! I posted a reply on your Blog Frog! Great product! Thanks for taking the time to do these give-aways! My husband just started taking his lunch to work so this would be great. Ohh, what a great system! We would love to win this! We are lunch packers all the way. It saves money and helps the whole family to eat a more nutritious lunch and snacks. Great idea! My son needs a new lunch box system for school this fall and this would be perfect! .-= Meg´s last blog ..I love Patterns and Projects On Demand! Giveaway Winner! =-. Love this, Great for school and Dad’s lunches! I follow you on Facebook and love this! I read your posts in my reader everyday! I’m so glad I found your site … I especially love that you are from Nashville so your information is accurate for me. This would help me pack my lunches more often and save more money! great giveaway! I pack my hubby’s lunch daily so this would be really handy! we pack our lunch everyday! that would be perfect! Daughter is starting school this year so it would be AWESOME! Tried to subscribe to daily emails but got a 404 error? What a great, financial, and environmentally friendly invention! Would love to win one for my husband! Awesome giveaway!! My husband would love this and get so much use out of it!! Would love to win this!! Looks great! I also subscribe to email! Oh yes! My husband only likes to take 1 container for his lunch, and this would be a perfect way for him to still do that but not have all his foods mixed together! My husband takes a lunch every day! Great way to travel with it. My husband always takes his lunch to work, so this would be great! This would be great for my on the go hubby! This is nice. Most lunchboxes don’t fit containers very well! I follow all your posts on my Google Reader! Thanks for the awesome giveaway! This looks like an awesome way to keep lunches organized…something my husband needs so badly! We’d put these to good use! I would love to win this prize!!! We pack lunches for school and for Dad’s lunch every day!! Thanks for sharing with us!! Excellent product – would love to have some compartment containers for lunches! Love it!! We have been wasting too much money on baggies in my husband’s lunch. This would be great for packing lunches for car trips with the kids! I don’t have a website, can’t get fb at work, don’t blog, just work full time with 2 kids in school/camp year round, and my husband just tolerates my couponing and saving (but loves that the bills have gone down). I would love to win – just to show him how cool all of this is!!! And, he takes a PB sandwich EVERY day!! I would LOVE to win a lunch box system. My husband takes his lunch EVERY day, I love this, thanks for the chance to win & I am a subscriber to your newsletter!! I love the green one pictured! Thanks! My hubby really needs this….he needs something to encourage him to bring a healthy lunch/dinner to work. .-= Elana Kahn´s last blog ..Versatile Blogger Award =-. These lunch boxes are wonderful…thanks!!! I follow both of you on facebook and posted the message to my wall. I posted a comment on your “Dads Rock Giveaway Bash” thread on blog frog. my husband takes his lunch daily. thanks! Great idea…. I always use a plastic container for my son’s lunch, but I love the compartments! .-= Lori M´s last blog ..Toy Story Buzz Lightyear pillow =-. These are amazing! They would make packing my husband’s lunch so much easier! My husband is very faithful about packing his lunch everyday!! I am always sending leftovers to work with my husband. It would be great to have a nice lunch box kit like this. Keeping my fingers crossed! I love this idea. Thanks for your part in making it easier for Dads like myself to live frugally! I am loving all of these sites. I have added them to my facebook & twitter!! Soooo excited!! I pack lunches every night. I am always looking for lids that seem to vanish! I am an email ubcriber. I love this. This would be great to give to my husband. He takes his lunch alot and it would be nice to have something handy like this! Thanks for the chance to win. I pack both DD and DH lunch each day so this would be great! .-= Kristin Duncan´s last blog ..I love a deal. =-. These days its hard to make ends meet with eating out all day. We do spluge every so often and do it, but most days its leftovers from supper the night before for lunch. I love the idea of giving out something useful! Would be great to get this! Thanks! I would love to win this. My husband is also into living a frugalicious life! I made reusable sandwich wrappers for my daughter’s lunch box and then also for my husband’s lunch box. Unfortunately, he doesn’t take sandwiches too often as of late, so something like this would be ideal to have. Thanks for the chance to win! .-= Tanya´s last blog ..Valentine’s Day Ladies’ Tea – Invitation Reminder & Menu =-. I received your newsletter through email. This is a WONDERFUL prize for my husband for Father’s Day!! Thank you! my husband takes a lunch to work every single day in a walmart sack…this would be PERFECT!!! These Easy Lunch Boxes look great! I would love to get a set for my hubby. Thanks for hosting this giveaway. I subscribe to Faithful Provisions…. …and follow you on Twitter. My husband would Love this for his lunches! Looks like a great system and I’d love to win it! My husband would love this! Great giveaway! This would be great!!!!! My husband takes his lunch to work everyday and usually grabs a grocery bag to put it in. But last year we started bringing our reusable bags to the grocery so we hardly ever have them! This would solve that problem!!! I would like this for picnics this summer! This would be a great way to get my husband to pack his lunch more often! Wow this is a great site! My friend just showed it to me. I’m going to visit often! Now a Twitter follower, and I tweeted as instructed. I follow on twitter as rncmom. This would be perfect for my constantly doing something family! This would be perfect for my hubby’s lunches!! i would love to win this and encourage hubby to take his lunch to work every once in a while!! I’m a happy email subscriber!! Great Giveaway! These look soooo neat! Love easy lunch boxes! Want more. Wish the bags had a longer or adjustable handle though. I follow Easy Lunch box on Facebook. My hubby would love to get this on father’s day. He takes his lunch everyday to keep cost down. What a great giveaway! It’s a great way to pack healthy lunches (and save money on NOT eating out) for Daddy!!! We are big lunch packers in my house!! Great Dad’s day gift!! I LOVE THE GIVEAWAYS!! Signed up to be an email subscriber. I am always packing everyone’s lunch at my house. I am sure my hubby would like something nicer than a brown bag. Love the giveaway! This would be very handy! This would be great for my son’s lunch and when we are on the go. This looks great. We could really use something like this! We pack lunches everyday, these would be great! I’d love to win this! Love ur site..it’s awesome! Just signed up for your daily email!! I would totally love this!! My husband packs lunch every nite for work. He never goes out and spending money on fast food. .-= liz´s last blog ..*HOT* Quiznos $2.99 Meal Deal Coupon =-. My hubby would love this awesome lunchbox so he can ditch the plastic Grocery Bags!!! Here’s my first entry….but question it says per day…can you enter daily? I replied on your discussion board to Do You Have A Garden? 6/9/2010 6:58:14 PM We planted our first garden this year. Tomatoes, Green Peppers, Banana Pepper, Green Beans, Carrots, Cauilflower, squash (3 different types) and pumpkins. I don’t really have any thing going on yet, but some purplish colors are coming out of the green peppers and orangish out of the squash. They almost look like flower blooms. Is this normal? Did I get seeds that were packaged wrong and are flowers. ???? This is normal. It is the blossoms that turn into the fruits or vegetables. You get to enjoy the flowers before you get the veggies. Hope all goes well. Have fun watching everything grow and change. It’s amazing! I am a email subscriber and follow you daily on FB. We’d use this every single day. Great lunch system. Thanks for the chance to win. Would love to win one of these! My husband has been taking his lunch to work for most of the 31 years we’ve been married. His lunch box is not looking so great! My husband would love this, right now he takes his lunch to work in Kroger bags! I have visited many of these web sites and just thought I would try having some fun to win something. This is exciting for me. I pack lunches everyday. This looks great! Great idea! I always pack my lunch since I am driving all day, and fast food is icky AND expensive! I subscribe to FP email. Following you on twitter and retweeted. Following you on facebook and posted message about contest. Replying with correct email addy. Awesome gift for my awesome hubby!!!! This looks great – hubby takes a lunch every day to work and this would be great for him – thanks! I really like these. M hubby would use these! Would love this for my husband’s lunches. would love this! It would make packing hubby’s lunch so easy! I am very interested! I pack 4 lunches everyday! I am a subscriber and have just been reading about these in “Lunch Lessons”. How cool that you are giving them away! I would love this. We always pack lunches and this would be great! I would love to pack a lunch and not use all the baggies. This would definitely work better for me than using sandwich bags all the time. What a cool product. I’d love to win it and try it! I would love to win this kit. My husband packs his lunch several times a week, this would be perfect. This sure would beat brown-bagging it! I’ve been trying to get my husband to pack his lunch more.. This might help! I would pack our picnic lunches in these. Well, this would be GREAT for his lunches! And I’m definitely going to buy a set for my 4 girls’ lunches this fall. Thanks for all you do! This would come in useful for summer picnics! I’d love to win this! It’s a great prize for both saving money and going green :). I think my dad would like it too. Thanks for doing these giveaways! .-= AmyLauren´s last blog ..Cruise Recap: Carnival Fantasy (Day 3- Nassau) =-. Also, I am an email subscriber- just subscribed today. I would love to have this for my husband! My husband could definitely use this! GREAT IDEA! WOULD DEFINITELY COME IN HANDY! This looks nifty. Maybe I would pack more lunches with one of these systems. this looks like it would make an awesome gift! My husband takes his lunch everyday. He is in need of a new lunchbox. Husband packs a lunch every day for work so this would be a GREAT thing to win!!!! With hubby being a firefighter, we always are looking for ways to pack his meals to go. This would be a great addition and help EVERY DAY! We’ve been trying to pack our lunches more often. My husband would love this! Thanks! Would be awesome for picnics! Posted again today on FB! We could really use one of these at our house! This would be very useful in my house! Nice lunch box! We are on the Dave Ramsey plan and my hubby brown-bags it nearly every day to help us stay on budget. What a great giveaway. Something every family needs!! My husband always packs his lunch. He usually just uses a plastic sack for packing. This system would be a great upgrade! We never have enough lunch boxes! What a practical idea! thanks for the chance to win. We could really use this! Thanks for the chance to win. As of today, you’ve been added to my blogroll. Nice giveaway. Thanks for the chance to win! this would be great – it would sure beat the grocery bag my husband takes his lunch in now! My husband could definitely use this! Very cool! We are all about packing lunches instead of buying so this would be great. This would be great for my hubby’s lunches. We would use this every day in our house. Great idea! We could really use this. We could really use something like this! We so need a new lunchbox for hubby! I’ve had my eye on these for a while; they will definitely come in handy now that it’s vbs and camp season! yay for giveaways for my hubby. Great items we would put this to very good use. This looks like it could be just what we’ve been looking for! My hubby has recently started carpooling, which means HAVING to carry his lunch on days that he isn’t driving. It’s saved us a lot of money, but is a real challenge when it comes to transporting his food in a way that is convenient without making a mess! So cute. Would love to win. Thank you. We totally need this! We were just commenting about the sad state of our tupperware. .-= Taralyn´s last blog ..Trying Out Breakfast on a Stick =-. thanks for the opportunity to win a lunch box. this looks like a great product! We pack so many lunches here, and these look fab! This would be great for hubby and his lunches. Such a practical giveaway!! I’d love to win this for my husband. He takes a lunch to work every day. Now that we have a 2 month old he has been packing his own lunch again. I follow in Twitter and tweeted this giveaway. This Easy Lunch box system would be great to get! My husband brings lunch to work everyday — this would be great! I love giveaways and he loves food! My hubby and I are trying to lose some weight, and packing our lunch is essential.. so these would be very useful. this would be great for making my hubby eat my food at work! no more fast food junk now! my husband would love this, i pack his lunch every day and most days he ends up with a flat sandwich. Awesome lunch box system… Thanks for the chance to win! would love to win for hubby! We pack my husband a healthy lunch every day for work. This would come in very handy. I pack my husband’s lunch for work every day, this would be wonderful! Great gift everyone can use this. Great giveaway..my daughters like using bento box things. This is awesome! I can never find a lunch box/container combo that seems to work. OOHh! This is a good one! Hope I win. My hubby needs this! This would be great for lunches or picnics! Would love this for him! Hubby likes to pack it up to go!! email subscriber – thanks again! We do leftovers to save money. I lost my divided container at work and haven’t found them since. This would be great for DH! This would be great to use to pack my husband’s lunch. This would make packing lunches a lot easier! Very Nice! I love the little containers! “Daddy” would love the aqua one! Great for the family lunchboxes! with today’s economy, we find ourselves packing our lunches a lot more – this storage solution would be great! I would use this for out beac trip this summer. This would be an upgrade from the plastic bags. I have been looking at similar systems and would love to try this one; thanks ! great lunchbox ideas–we’d sure use a product like this. This would make packing lunches a lot easier. Another Great Opportunity! Thank You! These are great. I would love to have them . This would make mornings a lot easier! Husband always takes leftovers to work for lunch. These are perfect containers for that. This would be so useful!! hubby packs his lunch, so this would be a great win! thanks! The Easy LunchBox Would be great for my son-in-law. He’s taking his lunches to work and trying to eat healthier. This way he could pack healthy portions for lunch and snacks. this would look better then the plastic bags we use! This would be very handy to have. This one would come in handy…. great idea! fix them the night before. pack them in the cooler in the morning! Cool! Thanks to Kelly and EasyLunch Boxes.com! These lunchboxes would be an excellent way to get my husband to eat healthier. Instead of grabbing lunch at a drive through he can take his lunch in these. He likes to eat hot foods, so a bag lunch won’t do. Taking several containers means too much dishwashing later. But these solve both of those problems and they look tough, too. Thanks, kelly! I used some from pottery barn kids that cracked and broke. I need a replacement set and these look much stronger. Oh my, here I am again, but I posted the link on fb! I LOVE this!! What a great giveaway! My husband loves to uses containers for all his lunches. He would like these! This looks very useful. I am always packing lunches. I would love to win this. It would be great for taking lunch to work. Great item to send lunch to work with my BF! Thanks. Your link is in the list for the Dads Bash Giveaway. This is something we could really use…thanks! Such a nice set. Thanks so much for the chance to win! i added you to my blog roll. thanks for the great contest! I would soooooo love to win this! Family of 6…need I say more? I would love to win this; thanks for the chance ! we carry a lunch a lot! I want to win this for my husbands lunches! The hubby definitely needs some of these for work! Seems like an easy way to pack healthy and frugal lunches! I would love to win this for my hubby for work! my husband takes his lunch to work everyday, this would be great!! Sure beats the yogurt containers we use now. Thank you for giving this Lunch box system away! My husband would love this! out of everything this is what i would love for him to have!